This Bee Sandra Gilmore needlepoint design is professionally handpainted onto 18 mesh brown mono Zweigart needlepoint canvas. This handpainted needlepoint has been stitchpainted for ease of stitching and an exquisite result. The design area measures 5.5" x 5" and it could be stitched out to an 8" x 8" square, or similar. 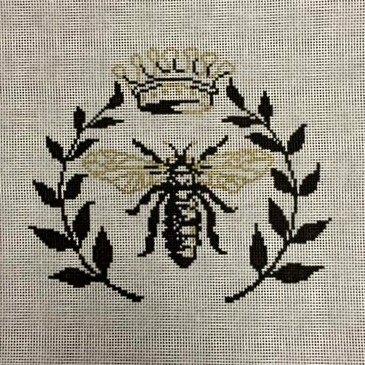 You can purchase this Bee Sandra Gilmore needlepoint design as canvas-only or with fibers. If you select cotton we will send you DMC embroidery floss or perle cotton; if you select wool we will send Bella Lusso; if you select silk we will send you Planet Earth Pepperpot boutique fibers. We can also work with you to customize your thread selection so be sure to contact us if you would like to discuss different options. Kreinik gold metallic thread is included with all thread options. This Sandra Gilmore needlepoint design is suitable for all levels of needlepoint experience. If you have any questions about this Sandra Gilmore needlepoint please contact us. We are always happy to help and we try to reply promptly. This design usually ships within 5 business days. Shipping is FREE with orders of $ 100 or more within the U.S. and $ 150 or more internationally. See our shipping policy.